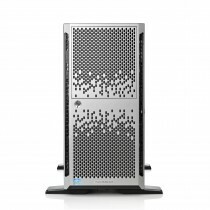 HP ProLiant ML350p Gen8, a dual-socket 4U tower server, offers a combination of high availability and power in a flexible chassis. Perfect for growing businesses and enterprise data centers the excels when working within virtualized and data-intensive environments. A range of Intel QuickPath Interconnect (QPI) E5-2600 V1 and V2 processors are available ranging from Quad Core affordable processors to high-performance Twelve Core power houses, equip with over 20% more power than the previous generation of Intel Xeon CPUs. 24 DDR3 ECC Registered DIMM slots give you access to 768GB of RAM alongside up to 24 High Performance SFF (2.5") disk drives or 18 Large Storage LFF (3.5") disks drives. Bargain Hardware stocks components to equip a variety of configurations for the refurbished HP ML350p Gen8 and with the Configure-To-Order (CTO) hardware options, you can build your new system to fit your requirements. If you require any assistance with your purchase then please don’t hesitate to contact our sales team using the contact us button.